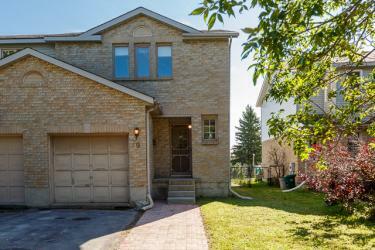 you wont want to miss out on the opportunity of this meticulously maintained and well priced three bedroom freehold end unit town home located in popular grenadier village which provides ease of access to schools, bus, shopping, trails and cfb kingston. thoughtful updates throughout, not to mention the newly extended driveway that provides ample parking for four vehicles. main level offers, open concept kitchen/living/dining combo, powder room along with new laminate and vinyl flooring. upstairs offers an over sized master with his and hers closets, full bath with updated sink and faucet, 2 good sized additional bedrooms and new carpet. downstairs provides an unspoiled basement, laundry and storage awaiting your final touches for additional living space. other updates to this lovely home: shingles 06, central a/c 06.